Here is the tank installed near the firewall. You can see the water flowing out each hose. The red hose is because I ran out of plastic. 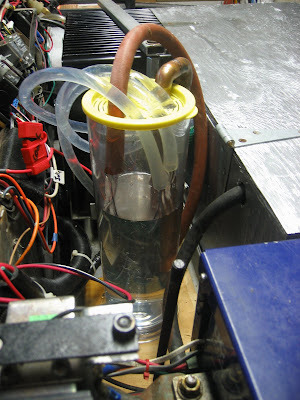 The copper tubing is a U that is supposed to feed the pump. Once it was primed, it worked fine. See the next post for the solution. I am using the charger set up for lead acid batteries. The cooling system comes on when charging nears completion. It seldom comes on when driving. It comes on at 90 degrees, so we will have to see what hot weather does to it.